My daughter loves playdoh. She loves using her creativity to make shapes and designs. 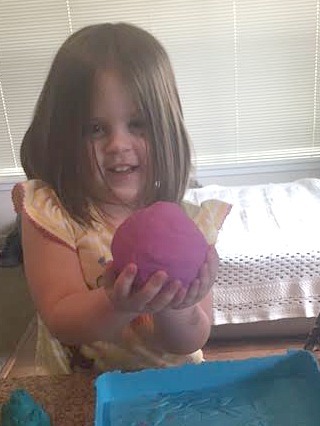 So when I got the opportunity to do a review of Kinetic Sand I knew I needed to get some for her. It turned out that the whole family ended up loving this fun product! I received the products mentioned below from Spin Master to facilitate this review. Regardless, this is my honest opinion. Kinetic Sand comes in both big and small amounts. 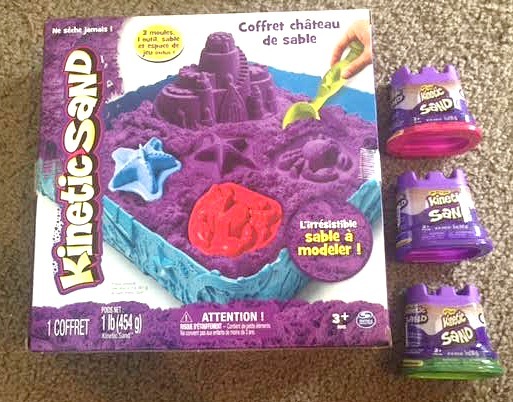 In our package from Spin Master we got the Kinetic Sand Castle Set along with three single containers. The single containers are a great option because you can have more options for colors. They are also easily stored in their containers which doubles as a mold for the sand. Buying a set is also a great option. My favorite included item would have to be the tray. 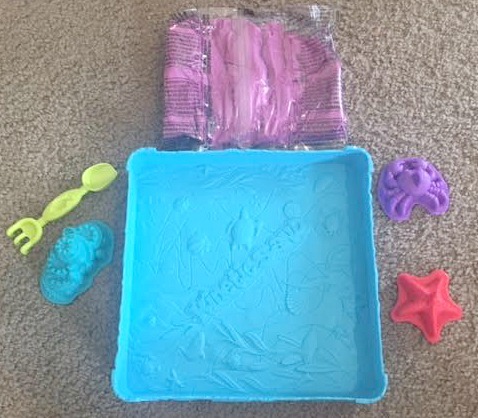 The tray is a great way for your child to have fun while you worry less about the mess. It helps contain the sand in one place and as long as your child is good at keeping it there than you will have so much less to worry about. We did have one incident when the sand got in the carpet but we were easily able to vacuum it up. The tray also makes clean up easy. We keep out kinetic sand in a Ziploc bag. When my kids are done playing all we have to do is dump it into the bag instead of having to scoop ever grain up. 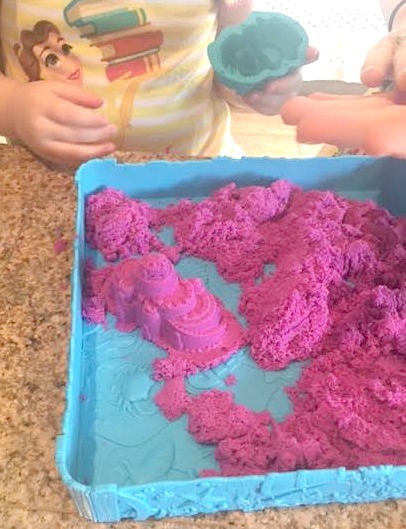 Kinetic Sand is super moldable. If you have never used Kinetic Sand than it is really an experience. It is like nothing I have ever played with. If you pack it together it can form shapes but then it can easily be broken apart and it just “melts” out of your hand. In the picture above in the middle left of the tray you can see a castle my daughter made. The mold did a great job at forming the sand. Then about two minutes after taking this picture my daughter easily broke the castle apart with one finger. It is so much fun building and even breaking your creations because of it’s unique texture. Kinetic Sand is one of new favorite activities. It is recommended for children ages 2-4. 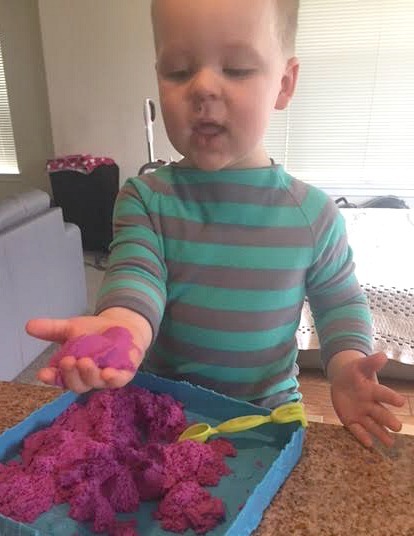 My son is 2 and he loves playing with the Kinetic Sand but he needs quite a bit of supervising when using it. My daughter is 4 and also loves it and I don’t see her stopping playing with it any time soon. Heck I am 25 and I love playing right along with them! Who in your life would love some Kinetic Sand? Would you get them a set or a few individual containers?